In a previous article, we’ve written about why it's easy for businesses to believe that simply centralising their contract information will solve their contract management problems, and why this isn’t the case. Having contracts stored centrally has many advantages, including making specific contracts and information easier to find. However, it’s only the first step. Without supporting processes and buy-in from staff, centralised contract storage won’t inherently make a business’s contract management significantly better. It helps to think of each contract as a collection of data-points. Even incredibly important contracts, which have involved tough negotiations or which are potentially transformative for a business should ultimately be distilled down to a series of data-points. These data-points, such as dates, amounts, names, departments, geographies etc. are what bring the contract management process to life. If you’re not familiar with the concept of contract metadata, you can read about it in our related article. However, as with any rich source of data, there are numerous ways to cut it and often numerous audiences who are interested in seeing it. This can present a challenge for those working in contract management to make sure that the right information is being measured and shared appropriately. Dashboards form a crucial part of this reporting mix. The core trait of a dashboard is that it should provide a quick view of company information. A dashboard isn’t the place for granular-level detail and lengthy data tables. Generally, it will provide a high-level summary of information and be used to highlight key trends and specific metrics. This subtle change helps to highlight that it’s important to be selective about what goes into a dashboard. While there are lots of important questions that you could choose to try to answer in a dashboard, there will perhaps only be 4-8 that you should. So what are these important questions when it comes to contract management? At Gatekeeper, our reporting and dashboards are completely customisable, meaning you can include and display any data that you deem to be relevant to your business. Which business contracts are scheduled to renew in the next 6 months? What is the value of these contracts? What is the combined value of the business’s contracts split by team/business unit/department/geography? What is the risk profile of the business’s contracts? How is the business’s actual spend tracking against contracted spend? How many contracts are currently non-compliant with company or regulatory policy? Which of the business’s vendors are scoring highly or poorly against their KPIs? These are the kinds of questions that dashboards are ideal for as they provide quick answers, summary views and alert users to time-critical actions that need to be taken. Now for the important part. Getting the answers to the questions above is only the first step in realising the value from dashboards. It’s vital that the information is then acted upon for the business’s benefit. Date-based notifications trigger a renewal process that includes an assessment of the current value of the contract, what the alternatives are and whether it should be renewed. This means that negotiations can be conducted from a position of strength and preparedness. Where compliance or certifications have lapsed for a vendor partner, remedial action is triggered to resolve it as quickly as possible. Where overspends or significant contract risks are identified, these are flagged to the relevant stakeholders to resolved. Cost consolidation opportunities are shared with finance, procurement and other interested internal parties to be investigated. Bottlenecks in core contract processes are identified and resolved quickly. Positive trends in all of the above metrics are clearly shown and the personnel responsible can be rewarded. Deciding what to exclude from a dashboard is as important as deciding what to include. 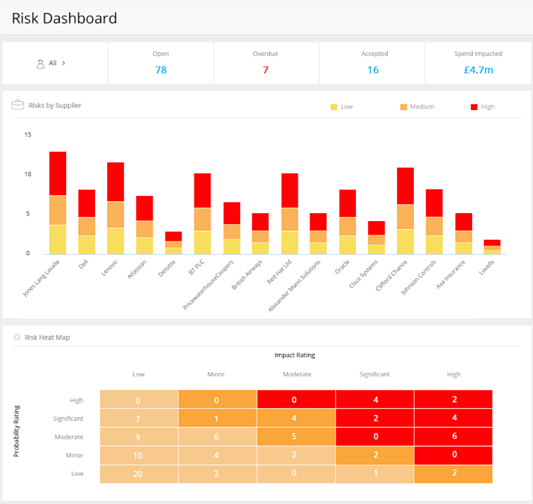 Dashboards should make instant sense to those viewing them, provide them with high-level data and flag urgent actions and significant shifts in key performance indicators. Provided you can drill into the data behind the dashboards, it makes sense to keep them as short as possible and just focus in on the key business questions to be answered. 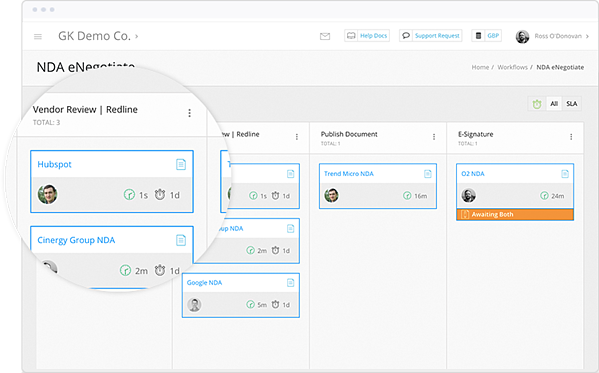 When it comes to contract management, different teams and departments will require different dashboard views. Some stakeholders will be focused on items such as renewals, compliance and time to signature. Others will be more interested in consolidated spend figures and contract risk. Gatekeeper accommodates these different requirements by including a range of dashboards along with completely configurable data fields. As a result, Gatekeeper’s reporting suite delivers the optimum blend of instant, actionable information and in-depth data modelling. If you’re interested in seeing how Gatekeeper can bring clarity and oversight to your business’s contracts then get in touch today.